The Seal is a powerful verification system that provides peace of mind for you, our customer. The bottom line is, anyone can claim to be an honest, legitimate company. But how do you KNOW? Many companies who claim to be licensed, insured and bonded are not. Many companies who claim to perform criminal background checks on their employees do not. If you hire an unlicensed company and an employee hurts themselves on your property or your property is damaged, your insurance company may deny the claim leaving you holding the bag. You can be fined up to $5,000 for hiring an unlicensed contractor whether you knew it or not. Many criminals use their employment to find their next victim. Every day companies large and small introduce dangerous felons to unsuspecting consumers lives. Many consumers think they are safe if someone is home with them when the service person is there. In fact, many crimes are committed up to six months after the service call. As a concerned member of our community, we want to ensure that you not only receive quality service, but you stay safe while doing so. 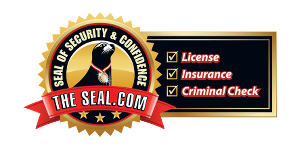 What Does The Seal Mean For You? We Invite You To Ask The Seal!